Getting out and seeing live events -- such as sports matches, concerts, or theatre performances -- can be a fun way to spend your free time. The problem is that you often need to purchase tickets in advance in order to be admitted to these events. This means going out to the box office and standing in line, waiting for other people to buy their own tickets. And by the time you get to the box office, you might be out of luck anyway if the event is sold out. Fortunately, there's StubHub.com. It's a faster way to get tickets, because you order them online (so you don't have to wait at the box office) and can often print them out almost immediately! Plus, it's a peer-to-peer service, so even if the box office says that a show is sold out, you might be able to get tickets to the event if someone on StubHub who already bought tickets doesn't want theirs anymore! By the same token, if you have tickets that you can't or don't want to use anymore, you can use StubHub to find other people who may want to buy them! So what exactly is StubHub? StubHub is an online ticket trading platform. It allows you to purchase event tickets from other users and then print them off the website or an email, or have them mailed to you. You can also use StubHub to list tickets that you don't need or want for sale, and see if other users are looking to buy them. StubHub is similar to websites such as Ticketmaster.com or SeatGeek.com. Signing up for an account on StubHub is easy, and it's free! Just enter your full name, email address, and a password, and you're good to go! Looking to score tickets? Just type in the event that you're looking for, pick the area of the venue that you want to be seated in, and enter your billing details. Your tickets will often be sent to you via email or available for download right on StubHub, so you can print them off and have them almost instantly! 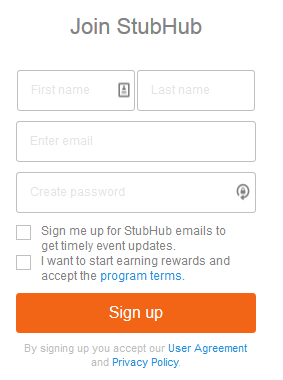 Sign up for StubHub's rewards program, and you'll earn credit every time you buy tickets on StubHub. Earn enough credit, and you'll earn a Fan Code that can be used to reduce the cost of your next purchase! StubHub guarantees that your tickets will get to you in time for the event, will get you entry into the event, and won't be significantly different from how they were listed on StubHub. If any of these guarantees is broken, or an event is cancelled, StubHub will refund you with money or Fan Codes, or even give you replacement tickets of equal or greater value compared to the ones you bought! Do you have tickets to an event and you can't (or don't want to) go? Post them on StubHub.com, and see if they'll sell! StubHub will walk you through listing all of the details that potential buyers will need to know about your tickets. It can even help you price them by comparing what other tickets for the same event are selling for on StubHub! If your tickets sell, you can have StubHub deposit your earnings in your PayPal account, or send you a cheque in the mail instead. Or, if you're feeling generous, you can have StubHub donate the proceeds from your ticket sales to one of their partner charities! That's a brief introduction to what StubHub is and how it works! Whether you're looking to buy tickets for that sold-out show or sell tickets to that event you can't make it to, StubHub makes it easy, fast, and convenient. Head over to StubHub.com today and see how simple it is to buy or sell event tickets online!